.Yaesu FT-991. Overall, nice. It would be nice to have more buttons and knobs... but you get used to what you have. .Radiosport RS60CF headset with footswitch PTT. Love it. Love it. Love it. .HF antenna is 20/40m dipole at 10m on masts straddling the house. I'm getting fantastic signal reports overall and think it's at a very nice height for 20m. Not so much on 40m. Pulleys atop each mast afford me the opportunity to lower and raise various wire antennae. Yaesu FTM-400DR. I've not really warmed up to VHF/UHF operations yet. But it's in place when we need it. 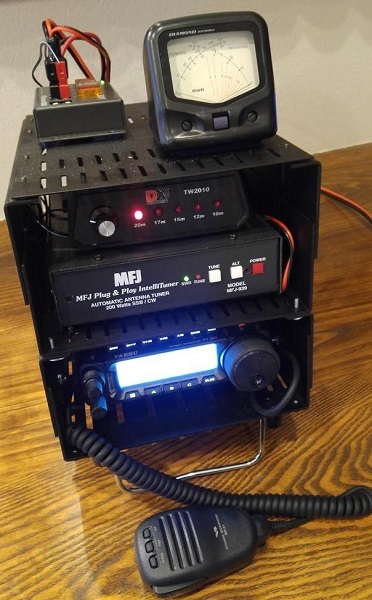 We activate our APRS beacon (AE6PL-9) for our portable HF operations. I drilled a hole in our roof for a NMO antenna mount to facilitate a clean installation into our new Honda Civic. Here is where K6LIZ and I are having the most fun! 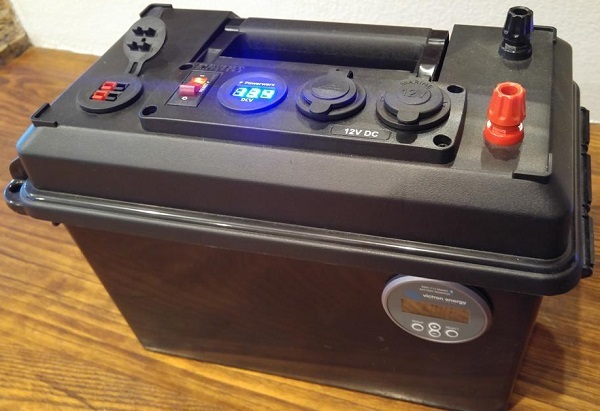 Our power supply is a self-contained Powerwerx PWRbox Portable with some modifications. 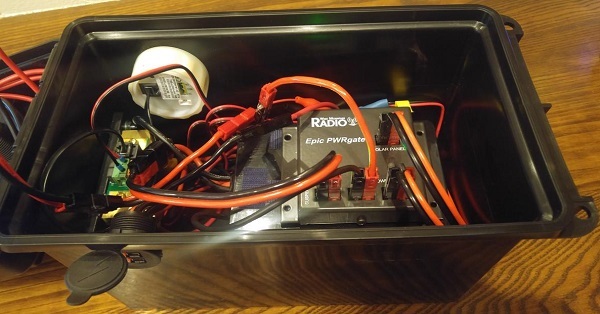 We mount a Bioenno 20Ah battery in the bottom (hook-and-loop), and place a West Mountain Radio Epic PWRgate on top. We added a set of powerpole bulkhead connectors to one side of the box serving for solar panel and/or power supply input. 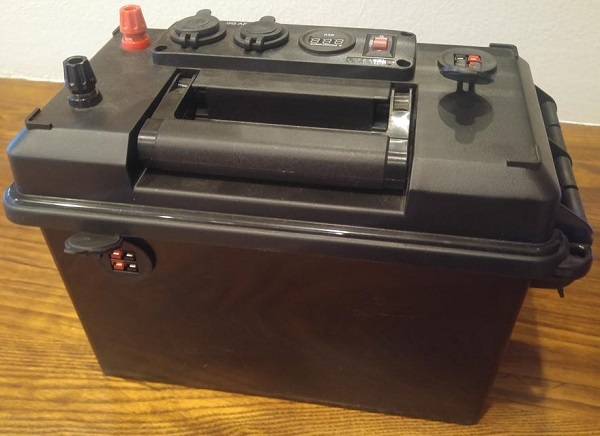 On the other side is a Victron Energy BMV712 Smart battery monitor. It has Bluetooth capability so we can easily monitor the battery condition. Our radio stack is housed in two Tac-Comm small units bolted together. We have a Yaesu FT-891, MFJ-939Y tuner, control box for the TW2010 antenna, a power/SWR meter and a West Mountain Radio 4004U power distribution unit. 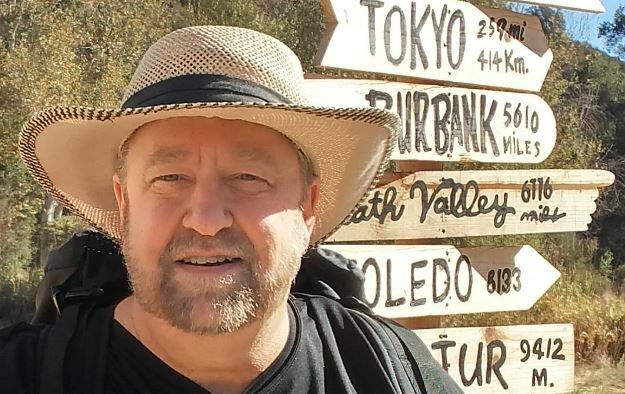 All devices are connected... so all we need to do is to hook up the antenna to the tuner, run a powerpole cable from the battery box to the input of the 4004U and we're on the air! We also have cable extenders so we can run from the front seat of the car with the gear in the back seat. So far, this seems to be a great setup. We also take a 120W solar panel, usually keeps us topped off all day and a .Yaesu FT-2DR HT (AE6PL-7).